Twenty of the most promising Francophone African tech start-ups will participate in the L'Afrique Excelle (Afrique-Excelle.com) residency in Mali, a full-week bootcamp set to kick off the Francophone edition of the World Bank Group's XL Africa, tech start-up accelerator. L'Afrique Excelle is powered by the World Bank Group and the Tubaniso Agribusiness and Innovation Center (TAIC) with financial assistance from the Italian Agency for Development Cooperation (AICS) and implemented by VC4A, Suguba and Sahel'Innov. • More detailed info. Consumer electronic devices, digital imaging solution and communication network are the major areas where Optoelectronics has huge market opportunity for its major High-brightness LEDs (HB-LEDs), CMOS image sensors and Fiber-optic laser transmitters components. In addition to this, increased demand for advanced technology in automotive industry is creating market opportunity for Optoelectronics. Most of the automotive vendors are integrating infrared components in cars for detect ambient light, whether estimation, gestured control for the infotainment console and night vision. These new application areas strengthen the Optoelectronics market share in emerging sectors. Optoelectronics Market: Drivers and Challenges The driving factor for Optoelectronics market is the growing usage of high brightness LEDs which are used in backlight systems of Tablets, smartphones and LCD television sets. Furthermore, rising usage of LEDs in illumination devices is also helping this Optoelectronics market to grow significantly in coming five years. Brewer adds that while there is huge potential for e-commerce in the region, compared to emerging markets, e-retailing in Africa is still in its infancy. A recent retailing study(2) conducted by Urban Studies on behalf of South African Council of Shopping Centres (SACSC), revealed that Africa and the Middle East’s share of global e-commerce in 2015 is just 2%, but that it shows high potential. This is supported by a recent report by McKinsey & Company, which revealed e-commerce could account for 10% of retail sales in Africa's largest economies by 2025. Google also predicts that a massive e-commerce market will emerge in Africa by 2017 as the continent becomes more familiar with technological advances. As e-commerce gains momentum, it once again highlights the potential for local retailers and entrepreneurs. A great success story is that of Bethlehem Tilahun Alemu, who founded soleRebels, a footwear company in Addis Ababa, Ethiopia in 2005. Within less than a decade, she has been able to grow her business from an organization of just five people, producing for her local market, to a global organization of over 300 employees with eight stand-alone stores, serving over 50 countries. The key to her success in a fiercely competitive retail environment was a combination of traditional African artisan skills and technologies, innovative use of local (often recycled) materials, personal drive and energy, and a global vision. Mahindra Comviva, the global leader in providing mobility solutions, announced an exclusive partnership with TRACE TV, one of the leading music channels to launch TRACE Music Stars across all Airtel operations in Africa. Contestants will have the chance to compete for a grand prize of 30,000 Euros and a recording deal with Universal Music. The winner will travel toto New York to be personally mentored by American R&B and hip hop recording artist, songwriter, and record producer, AKON. The grand finale will be held on March 2015. Mahindra Comviva is providing a complete ecosystem and end-to-end solution for the rapid deployment, provisioning, execution, management and billing of various value added services to enable this initiative. Additionally, Mahindra Comviva’s mKaroke will provide the users with real-time singing analysis and voice supervision to deepen the user engagement. TRACE Music Stars will be executed as a large-scale branding campaign and value added music service, available exclusively for Airtel subscribers. It is an IVR based music competition that gives subscribers the opportunity to become the next big music star in their country and possibly across Africa and the world without having to go through long and expensive traditional castings. The competition will offer participants an option to rehearse on a phone karaoke that scores their performance. On scoring low points the contestants can try again without having to stand in long queues. Cellebrite, the leading provider of retail mobile data solutions, and Webroot, a leader in cloud-based security intelligence solutions, today announced a technology partnership. The WebrootÒ Mobile App Reputation Service and URL Classification Service will be integrated with Cellebrite’s Diagnostics solution. The combination will enable mobile operators and mobile retailers deploying Cellebrite’s Diagnostics to proactively identify and remediate security threats and performance problems on their customer’s mobile device by leveraging the extensive Webroot threat database, which contains millions of mobile application and website antimalware signatures. The addition of antimalware capabilities from Webroot to Cellebrite’s comprehensive mobile device diagnostics solution allows wireless retailers to increase customer smartphone satisfaction while avoiding costly repairs. The integrated solution addresses the emerging class of phone problems and threats caused by mobile malware—in addition to detecting and correcting problems resulting from a wide range of hardware faults and operating system malfunctions. With the delivery of the integrated Webroot solution, Cellebrite becomes the first and only multi-channel phone diagnostics solution provider to offer antimalware detection and removal to mobile carriers and retailers, and the first such vendor to provide this market with cloud-based mobile threat protection from Webroot. Webroot security intelligence services have analyzed more than 7.8 million mobile applications and categorized more than 10 billion web URLs with sophisticated website reputation scoring to identify and block mobile threats and malicious websites on iOSÒ and AndroidÔ devices. The combined offering will enable mobile retailers to immediately address customer problems related to mobile malware – in addition to problems emanating from other sources – at the point of sale by running Cellebrite Diagnostics on a device. At the customer’s direction, the suspicious applications, websites or malware can then be immediately removed from the device. By identifying and removing threats, mobile retailers can limit reputational damage due to customer dissatisfaction and reduce costs due to malware-related issues, such as unnecessary returns, repairs, or network performance issues. The solution’s general availability is scheduled for the second calendar quarter in 2014. Cellebrite is a world leader in delivering data and diagnostics solutions for the mobile value chain. Operators and retailers are provided with advanced value-added services to enhance the customer’s experience and improve satisfaction. The company’s advanced retail mobile solutions are unique in offering in-store phone-to-phone content transfer, backup and restore, diagnostics, application and content delivery. In addition, Cellebrite offers retailers monitoring, statistics and analysis of sales activities. The company has more than 150,000 units deployed at more than 200 mobile carriers and retailers globally, representing well over 100,000 stores handling hundreds of millions of transactions a year. Founded in 1999, Cellebrite is a subsidiary of the Sun Corporation, a publicly traded Japanese company. Webroot is the market leader in cloud delivered security software as a service solutions for consumers, businesses and enterprises. We have revolutionized internet security to protect all the ways you connect online. Webroot delivers real-time advanced internet threat protection to customers through its BrightCloud® security intelligence platform, and its SecureAnywhereÔ suite of security products for endpoints, mobile devices and corporate networks. Over 7 million consumers, 1.5 million business users and 1.3 million mobile users are protected by Webroot. Market leading security companies, including Palo Alto Networks, F5, Cisco, Aruba, NetCitadel, GateProtect, Microsoft and others choose Webroot to provide advanced internet threat protection for their products and services. Founded in 1997 and headquartered in Colorado, Webroot is the largest privately held Internet security company in the United States – operating globally across North America, Europe and the Asia Pacific region. For more information on our products and services, visit www.webroot.com. The African Insurance Organisation has long warned that lack of information and communication technology (ICT) infrastructure is holding the African insurance market back. The additional challenge of getting legacy systems to provide improved risk management and mobile services, is forcing insurers to rethink their systems strategy. Rhys Collins, Head of African Operations for SSP says modern technology overcomes these challenges, and this is increasingly drawing new players into the African insurance market. Both Hollard and Sanlam, for example, have had good success in Ghana, Kenya, Tanzania, Zambia, Botswana and Nigeria and are believed to be eyeing other opportunities across the continent. As well as regulatory changes, SSP says the growth in mobile is the other key trend to watch in the African insurance market. Unlike other markets, the African consumer is by-passing the desktop internet connection and going directly to hand-held devices,” says Collins. SSP is the global technology company with unrivalled expertise across the entire general insurance supply chain - shaping a better industry. With the greatest knowledge, talent and technology in our market, we bring value to every client engagement. • Knowledge: Over 25 years’ experience • Talent: 700+ of the most talented IT professionals • Technology: The broadest range of capabilities. There is nobody better equipped to deliver business capabilities that improve performance, facilitate greater distribution and enhance customer experience for the best return. PROMISE Technology, Inc., a leader in developing high-performance RAID storage solutions that solve the unique challenges customers face in the data center, surveillance, cloud, and rich media markets, today announced that it will be showcasing its complete line of storage solutions at CeBIT 2013 (Hall 2, Stand B54) from March 5 - 9 in Hannover, Germany. Attendees of CeBIT 2013 can experience hands-on demonstrations of the latest VTrak enterprise-class storage solutions from PROMISE, which an increasing number of the world’s leading data centers rely on to ensure critical data is consistently available and manageable. Additionally, attendees can discover how PROMISE’s new Vess A2000 Series NVR appliance for IP video surveillance, pre-loaded with the latest video management software from Milestone, helps protect companies and organizations from the growing threats they are facing today. Data Center Storage Solutions: Fast becoming the top solution the world’s leading data centers trust with their critical data, the VTrak family of enterprise-class storage solutions provides industry leading performance and reliability for mission critical environments at an affordable price. Surveillance Storage Solutions: The Vess A2000 Series are NVR appliances built especially for mid-size to large scale IP video surveillance deployments, including banks, malls, casinos, factories, and many more installations. See demonstrations of the Vess A2000 Series in action with the world’s best video management software from Milestone, AxxonSoft, CamIQ and Genetec. Plus, see the most cost-effective external storage solutions for video surveillance, the Vess R2000 and Vess J2000. Cloud Storage Solutions: SmartStor Cloud is a hybrid cloud solution that enables users to store all their files in one place, so the files can easily be accessed from anywhere and shared with others. Attendees of CeBIT 2013 can see exciting demonstrations that illustrate how SmartStor Cloud is ideal for businesses because it provides convenient mobile access and file sharing while still enabling IT to securely control data and manage user accounts. Rich Media Storage Solutions: PROMISE is proud to showcase the world’s fastest and widest range of storage solutions with Thunderbolt technology, including the ultra-portable Pegasus J2, the versatile Pegasus J4, and the lightning fast Pegasus R4/R6. Attendees can evaluate which Pegasus storage solution meets the demands of their creative application. To learn more about PROMISE Technology and its dynamic line of storage solutions, attendees can visit PROMISE Technology at CeBIT 2013. Avere Systems has announced that the Library of Congress has selected the company to increase the efficiency and performance of its storage infrastructure. The Library of Congress website and file repositories will be supported by Avere's FXT Series Edge Filers, enabling congressional and public users quick access to valuable content. "The Avere FXT Series, with its ability to deliver up to 150 TB of Flash in a single cluster, was built to address the difficulty of providing fast and scalable access to large amounts of content typified by the Library of Congress data environment," said Ron Bianchini, president and CEO, Avere Systems. "This is a tremendous achievement for Avere and we are excited that our products are helping the Library of Congress deliver its massive data stores to users." As the world's largest library and the research arm of the United States Congress, the amount of digitized data is staggering. With a collection of 150 million-plus items ranging from cataloged books, to manuscripts, to sheet music and sound recordings, the government agency required a robust and scalable NAS solution for this data. With the help of Avere, the Library of Congress can optimize the performance of its current storage environment and can consolidate the management of millions of files into a single global namespace. "The Library of Congress is a great example of how to address big data management with hybrid storage systems that are highly performant yet highly efficient," said Rebecca Thompson, vice president of marketing, Avere Systems. Avere Systems brings to the market NAS Optimization solutions designed specifically to scale performance and capacity separately and take advantage of new storage media using real-time tiering. Avere's FXT Series Edge filers allow organizations to achieve unlimited application performance scaling, free applications from the confines of the data center by eliminating latency and cut storage costs by more than half. Satellite communications: visit Altobridge website. Therefore, manufacturing companies are moving towards Bill of Material Management Software to streamline interrelated product information management and multiple linked Bill of Material management. The software also helps to share the Bill of Material information across the different department. The Increasing demand for low cost Bill of Material management software across multiple industry vertical such as consumer goods and retail, healthcare and life science and transportation fuel Bill of Material Management Software Market. Small and Medium Size businesses are implementing Bill of Material Management Software to lessen their dependency on Traditional Bill of Material methods. Bill of Material Management Software Market: Drivers and Challenges The major factor driving Bill of material software market is the modernization of business processes. Internet is growing extensively due to which companies are adopting modern technologies such as cloud, mobility and other within their existing infrastructure. Implementation of modern technologies is helping company to adopt Bill of Material software that provides companies to access information related to partners, suppliers, product, cost and compliance status at single sign-in. Small and medium players are also adopting this software in order to identify risk components, centralize their work, monitor parts availability and to eradicate redundancy. The restraint for Bill of Material software market is the lack of customization and security threat. Most of Organizations are looking for flexible solutions as organizations sometimes need separate Bill of material for specific customer order where Bill of Material management software does not provide customized solution. Moreover, rising cyber-crimes has led organizations demand software that can also provide security to the information related to the pricing, customer, and products and other. Key Contracts: In October 2016, Arena Solutions partnered with Perception software a subsidiary of Altium, to integrate Arena Bill of Material software into Altium solutions In March 2015, Siemens entered into partnership of Thinkstep and launched new Bill of Material Management software. This integrated solution is helping user to manage material lifecycle and to streamline product design. The map of Russia includes 155 212 municipalities, allowing address search and providing road network for 10 960 of them. The address database contains 8 427 476 unique addresses. The POI database has been updated and extended as well, including now the total of 1 074 862 POI. Length of the road graph is 3 870 215 km. Current changes of the road network as per November 1, 2014 have been added to the map, as well as new interchanges and overpasses. The map of Ukraine includes 29 976 municipalities, allowing address search and providing road network for 1 590 of them, 2 136 247 addresses being available for the address search. The POI database has been updated and extended including now the total of 114 086 POI. Length of the road graph is 1 124 476 km. Address data inconsistencies for Ukraine road network were fixed, taking into account NAVITEL® users’ messages from official forum and through bug-tracker on the official website. The map of Belarus includes 22 879 municipalities, allowing address search and providing road network for 737 of them, 602 788 addresses being available for the address search. The map contains 61 434 POI. Length of the road graph is 284 321 km. The map of Kazakhstan includes 9 760 municipalities, allowing address search and providing road network for 86 of them, 268 583 addresses being available for the address search. The map contains 16 808 POI. Length of the road graph is 1 258 510 km. You can visit the "Coverage" section of the website to get more information on new maps, available for other countries. • Important: Please note that Q3 2014 maps are compatible only with the 9.1.0.0 and later versions of Navitel Navigator. Cape Town •DHL, the world’s leading logistics provider, has issued a new study on Augmented Reality in logistics, focusing on possible applications of this emerging trend in the different stages of the supply chain. The trend report illustrates how operations in warehouses, during transportation and last-mile delivery as well as value-added services could be enhanced by computer-generated sensory input such as videos or graphics. The trend report has been developed by DHL Customer Solutions & Innovation’s Trend Research team as part of an on-going research project into Augmented Reality in logistics. DHL is planning to test some of the derived use cases in proof of concept studies. Augmented Reality (AR) – a live, direct or indirect, enhanced view of a real-world environment whose elements are augmented by a computer-generated sensory – merges what’s real and what’s computer generated by adding layers of digital information, such as sounds, videos, graphics or GPS data, in the line of vision with the use of a devices, such as glasses or smartphones. “Recent developments such as heads-up displays on windshields or use of Augmented Reality for vehicle repairs from the automotive sector shows how rapidly this technology is developing and finding its way into industries outside of the IT sector. 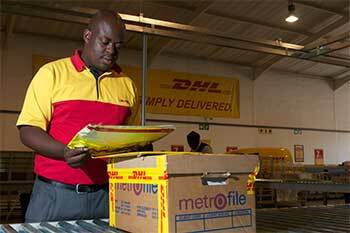 We believe that the technology also offers significant potential for the logistics industry, and are currently selecting cases for further research,” explains Charles Brewer, Managing Director of DHL Express Sub Saharan Africa. The trend report explains briefly the emerging trend and innovation in Augmented Reality technology and hardware and how it can be implemented in logistics. It also provides an overview on best practices from various industries. “Augmented Reality in Logistics” presents 11 different possible applications for the industry, among them improved picking in warehouses for example, by equipping staff with head mounted displays, they could find the right route and the right item more efficiently. The surplus in information would also reduce picking errors. SanDisk Corporation ha anunciado hoy la nueva tarjeta de memoria SanDisk Ultra® microSDXC™ UHS-I de 128GB, la tarjeta de memoria microSD con la mayor capacidad del mundo. Más pequeña que una uña, la nueva tarjeta Ultra microSDXC de SanDisk permite a los consumidores utilizar sus teléfonos y tabletas como si nunca hubieran tenido que preocuparse por las limitaciones del almacenamiento, permitiendo a los usuarios capturar miles de canciones, fotos y horas de vídeo en una única tarjeta extraíble. “La tarjeta de memoria de alto rendimiento de SanDisk – la SanDisk Ultra microSDXC de 128 GB – cambiará la manera en la que los usuarios interactúan con sus dispositivos”, dijo Stuart Robinson, director, Tecnologías de Terminales en Strategy Analytics. “Hasta ahora, los consumidores tenían que almacenar sus contenidos en múltiples productos porque la memoria de cada dispositivo no era suficiente para guardar todos los datos en un único lugar. Esta tarjeta microSD de 128 GB se va a convertir en la opción preferida para el almacenamiento extraíble, proporcionando a los usuarios un acceso rápido, seguro y fiable a sus archivos de datos personales”. Diseñada para los smartphones y tabletas Android™, la nueva tarjeta SanDisk Ultra microSDXC proporciona a los consumidores la capacidad más alta en un dispositivo extraíble. Ideal para grabar vídeos en Full HD y hacer fotos de alta calidad, la tarjeta SanDisk Ultra microSDXC de 128 GB es dos veces más rápida que las tarjetas de memoria microSD normales3 y ofrece el mejor rendimiento de grabación en vídeo disponible. “La nueva tarjeta SanDisk Ultra microSDXC demuestra una vez más cómo SanDisk sigue extendiendo las posibilidades del almacenamiento para que los consumidores puedan aprovechar nuestros últimos avances tecnológicos”, dijo Susan Park, directora, marketing de productos de retail, SanDisk. “Con 128 GB de almacenamiento extraíble, los consumidores disfrutarán de la libertad de poder captar y guardar los contenidos que quieran en un smartphone o tableta, sin preocuparse de quedarse sin espacio de almacenamiento”. Mejoras en la aplicación SanDisk Memory Zone: organizar, optimizar y guardar copias de seguridad de los smartphones Android de manera más inteligente. Una nueva versión de la aplicación SanDisk® Memory Zone (disponible en la tienda Google Play™ en su versión beta) permite a los usuarios visualizar, acceder y guardar copias de seguridad de todos sus archivos con facilidad, desde la memoria de sus teléfonos en un único lugar. Como parte de la aplicación SanDisk Memory Zone, SanDisk lanzará OptiMem™, una nueva característica que permite a los usuarios de Android mejorar la memoria interna de su teléfono al transferir de forma automática algunas de sus fotos y vídeos antiguos a su tarjeta microSD4. OptiMem monitorizará los niveles de memoria del dispositivo móvil del usuario de forma continua y les informará en el momento en el que la memoria interna llega a estar por debajo de un umbral ya definido. Comparado con el formato de tarjeta microSD cuando se lanzó por primera vez en 2004 con 128 MB de capacidad, SanDisk ha multiplicado la capacidad de almacenamiento de las tarjetas microSD por 1.000 en menos de diez años con la tarjeta SanDisk Ultra microSDXC de 128 GB. Para hacer posible 128 GB de almacenamiento en una tarjeta microSD extraíble, SanDisk ha desarrollado una innovadora técnica propia que permite que 16 dados de memoria puedan apilarse verticalmente, cortados uno a uno para ser más fino que un pelo. Las familias de tarjetas de memoria SanDisk Ultra microSDHC/microSDXC estarán disponibles en España con capacidades de entre 8 GB y 128 GB en los próximos meses. En EE. UU., la tarjeta SanDisk Ultra microSDXC de 128 GB se puede comprar exclusivamente en BestBuy.com y Amazon.com, y estarán disponibles con capacidades de entre 8 GB y 128 GB con PRVP de entre 29,99 y 199,99 USD. SanDisk estará mostrando la nueva tarjeta de memoria SanDisk Ultra microSDXC de 128 GB en su stand en el Mobile World Congress, en el Pabellón 7, stand 7A61. Allí también se estará exhibiendo la nueva unidad flash embebida iNAND Extreme™. Kirusa, the leader in voice and social media solutions for emerging markets, is hosting a luncheon panel on “Driving Smartphone Adoption in Emerging Markets”, featuring African superstar Yvonne Nelson at 12 noon in Glub Restaurant in Porta Fira Hotel on 25th February 2014. The next big step for emerging markets is data usage on Smartphones. Smartphone use in emerging markets is on rise and major mobile manufacturers and distributors are starting to focus on designing devices that cater to the needs of developing regions. Thanks to a host of new entry level models from leading brands like Samsung, Nokia and Blackberry, the emerging markets of Asia and Africa are on the brink of a Smartphone revolution. Kirusa is directly integrated with more than 35 major carriers in 20 emerging market countries. With more than 80 million monthly unique subscribers, and 1.3 billion monthly events, Kirusa enables emerging markets’ mobile subscribers to “Have a Voice” and share their stories with friends and families across the globe. Kirusa’s unique footprint provides an unparalleled distribution network that can be leveraged by marketers, advertisers and publishers alike to engage the “next billion” of mobile users. Kirusa’s Celeb Connect service brings a common man closer to the celebrities he admires. It empowers people to connect to the role models they idolize on screen. Kirusa bridges the connectivity gap with its cutting-edge mobile solutions. Kirusa’s recently launched InstaVoice app provides the growing African and Indian Smartphone segment with text and voice chatting, along with missed calls and visual voicemail, brought together in a compelling interactive user interface. SkyVision Global Networks Ltd. announced its launch of a full suite of Cloud services and solutions. The official launch will take place at AfricaCom 2013, November 12-14, Cape Town, Booth C14. AfricaCom is an integral part of the company’s ongoing commitment to expanding its activity within the telco market and throughout Africa. SkyVision’s success in Africa is the result of a comprehensive network of local partners and representatives, and SkyVision offices in Nigeria, South Africa, Senegal, Guinea Conakry, Cameroon, Burkina Faso and Morocco. As a leading service provider in Africa, SkyVision provides viable solutions that help African companies, organizations and service providers develop their ICT capabilities, increase their productivity and profitability, and the level of service they provide to their customers. SkyVision cloud-based solutions will enable customers to reduce overall IT expenses by deploying new applications without having to purchase additional hardware, software licenses, or be concern with scale up/scale down their computing and storage resources. SkyVision is a leading global communications service provider, offering comprehensive, integrated solutions to meet all corporate, government and telco market requirements. Via its gateways in Europe, North America, Africa and the Middle East, the company provides IP connectivity with access to the global Internet backbone, as well as an extensive suite of both customized end-to-end solutions and industry-standard services. With a network spanning 100 countries, SkyVision’s solutions combine global reach with active local presence and support. SkyVision’s customers include telecos, ISPs, cellular operators, global and local enterprises, government entities and NGOs.